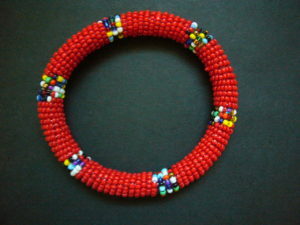 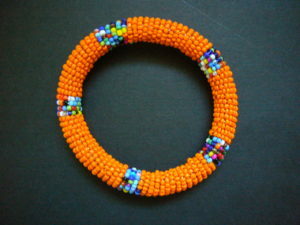 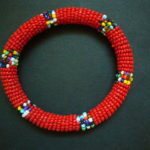 All things beaded in traditional Masai bright colours! Masai Bead Blue Bangle – in an assortment of sunny bright colours, these eye-catching bangles are handmade by the Masai ladies in Kenya. 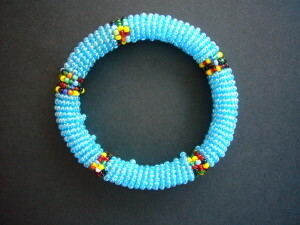 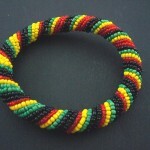 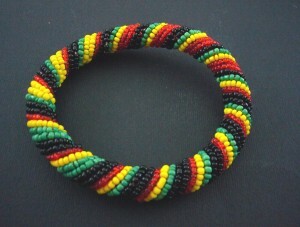 Glass bead is tightly woven around a flexible inner tube, so the bangle can bend slightly to fit. 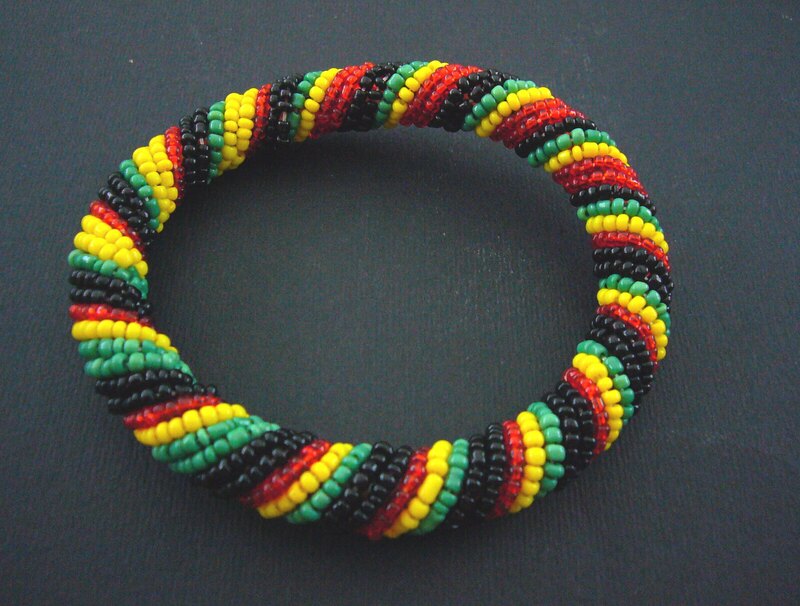 Light, easy and comfortable to wear – perfect for that bohemian look! 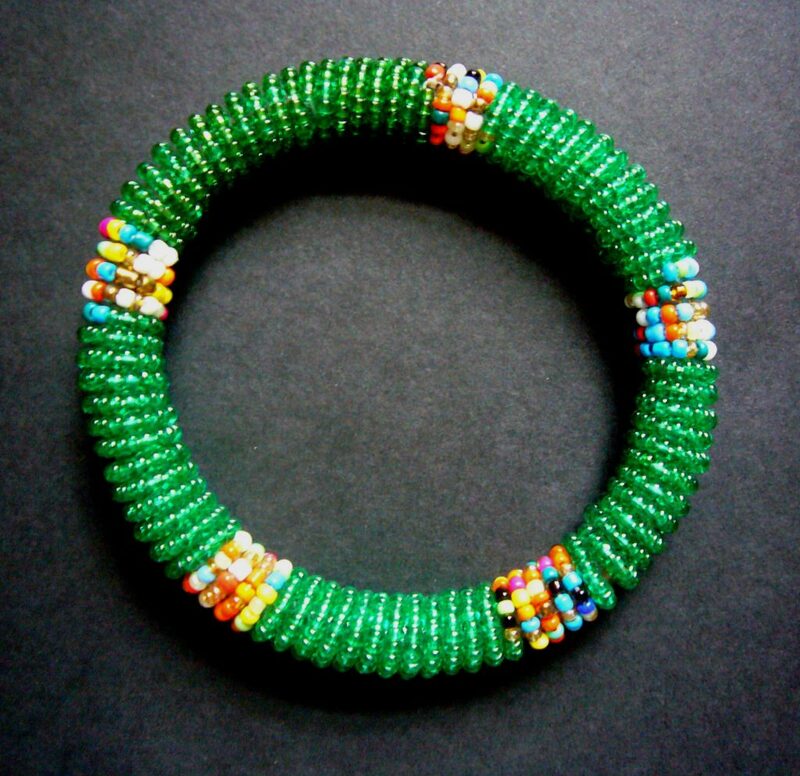 Masai Bead Bangle in green/multi stripe – these eye-catching bangles are handmade by the Masai ladies in Kenya and come in an assortment of sunny bright colours. Masai Bead Bangle in orange and multi stripe – these eye-catching bangles are handmade by the Masai ladies in Kenya and come in an assortment of sunny bright colours. 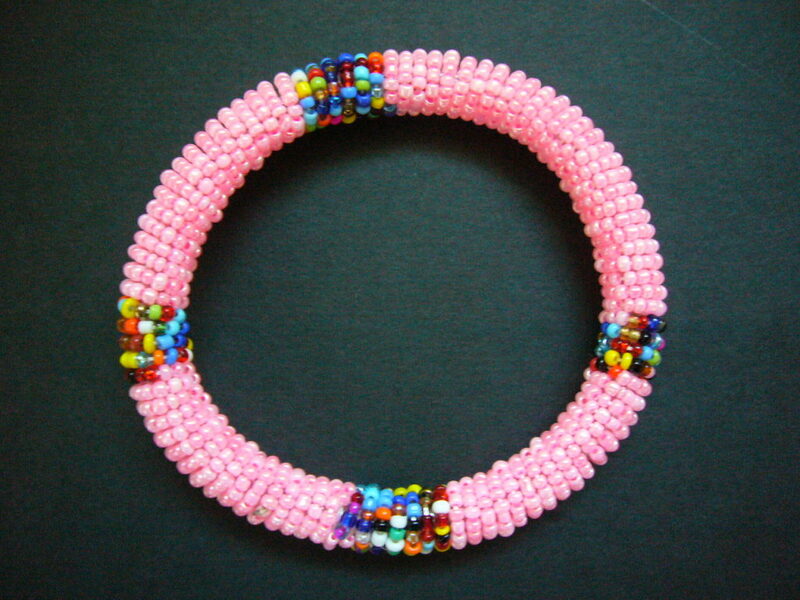 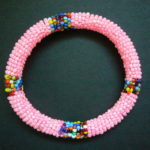 Masai Bead Pink Bangle – in an assortment of sunny bright colours, these eye-catching bangles are handmade by the Masai ladies in Kenya. Masai Bead Bangle – in an assortment of sunny bright rasta colours, these eye-catching bangles are handmade by the Masai ladies in Kenya. Masai Bead Bangle in red and multi stripe – these eye-catching bangles are handmade by the Masai ladies in Kenya and come in an assortment of sunny bright colours. 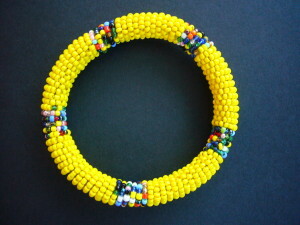 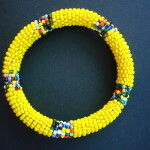 Masai Bead Yellow Bangle – in an assortment of sunny bright colours, these eye-catching bangles are handmade by the Masai ladies in Kenya. 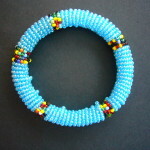 Masai Bead Lig ht Blue Bangle – in an assortment of sunny bright colours, these eye-catching bangles are handmade by the Masai ladies in Kenya. 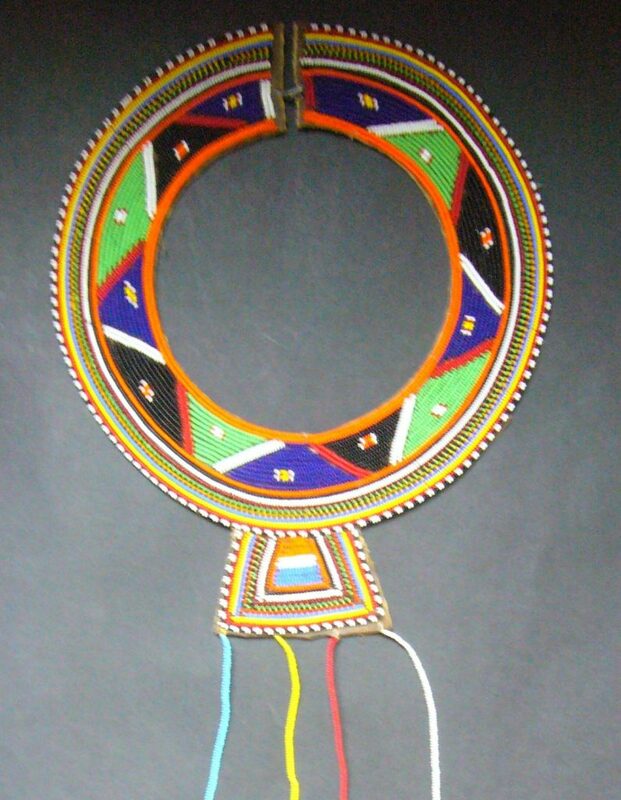 A traditional handmade Masai necklace collar with beading handstitched onto a leather backing and hook & eye fastener. 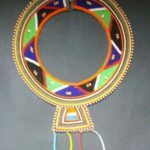 Wear it or hang it on the wall! 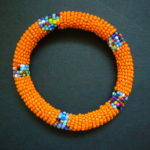 Ethically sourced from a women’s craft cooperative in Kenya, this is a Fairtrade item. 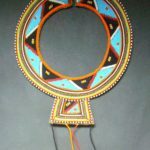 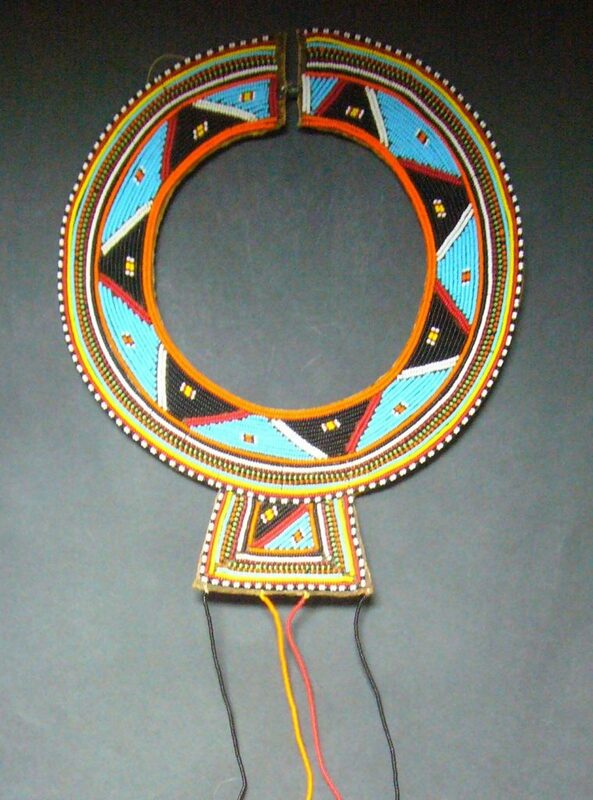 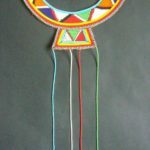 The main bead colour is a mixture of bright Masai colours with traditional shell pendants.